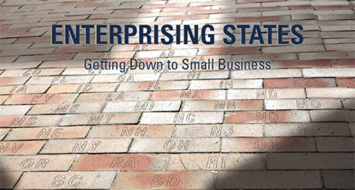 The following is an exerpt form a new report, Enterprising States, released this week by the U.S. Chamber of Commerce Foundation and written by Praxis Strategy Group and Joel Kotkin. Visit this site to download the full pdf version of the report, or check the interactive dashboard to see how your state ranks in economic performance and in the five policy areas studied in the report. Nothing better expresses America’s aspirational ideal than the notion of small enterprise as the primary creator of jobs and innovation. Small businesses, defined as companies with fewer than 500 employees, have traditionally driven our economy, particularly after recessions. Yet today, in a manner not seen since the 1950s, the very relevance and vitality of our startup culture is under assault. For the country and the states, this is a matter of the utmost urgency. The central motor of the job engine clearly is not firing on all cylinders. Historically, small business has accounted for almost two-thirds of all net new job creation, but recent research shows that the rates of new business startups are at record lows. The “gazelle companies”—fast-growing firms, mostly younger ones—have traditionally made outsized contributions to new job creation. After previous recessions, these businesses drove job growth and, perhaps more important, created innovations that often spread to larger, older, more established firms, which sometimes later acquired them. Weak job growth has touched the entire economy. Gross domestic product growth is weak, unemployment remains at nearly 8%, and business sentiment is far from optimal. Despite high stock prices and consistently strong corporate profits, the rate of employment growth remains lower than the rate of the expansion of the workforce. Given the understandable focus of larger firms on boosting productivity and on investing capital into technology, it’s highly unlikely these companies will create enough jobs to dent our huge and growing employment deficit. Policymakers ignore small business at their own peril and that of the economy. Small business may be down, but it is far from out. There have been some small, subtle upward shifts in employment in three of the industries—construction, manufacturing, and retail—that bore the brunt of the recession-driven job losses. Any sustained uptick in growth will further widen the opportunities for small business to expand and perhaps recover something of its past vigor. It is critical that states and communities that embrace a pro-enterprise vision address a rapidly changing small business environment. Small business today reflects a host of ethnic, social, and generational changes. Successful programs will need to adapt to these new realities that reflect a far more diverse, and profoundly different, set of players. Immigrants constitute a growing and important part of the entrepreneurial landscape. Even in the midst of the recession, newcomers continued to form businesses at a record rate. The number of women-owned firms has grown at one and a half times the rate of other small enterprises over the past 15 years. These companies now account for almost 30% of all enterprises. Finally, there is the issue of generational change. Baby boomers were, on the whole, a profoundly entrepreneurial generation, and by many measurements their Generation X successors have proven even more so. The millennial generation, based on recent assessments, may be somewhat less entrepreneurial than their predecessors. We are also witnessing the rise of a new kind of enterprise that often employs no more than the proprietors but frequently provides quite sophisticated high-level products or services. In many cases, these “jobless entrepreneurs” include corporate executives, technicians, and marketing professionals who, by either choice or necessity, have chosen to strike out in their own micro-enterprises. A large portion of this growing “1099 economy” comes from the growing ranks of boomers who are no longer willing or able to work for a larger enterprise. According to the Census Bureau, small business without payroll makes up more than 70% of America’s 27 million companies, with annual sales of $887 billion. Every state has policies and programs that are intended to encourage entrepreneurship and support small business development and expansion. Many states have introduced legislation or established programs to focus on startup companies, and many states have bolstered policies targeted at helping existing businesses grow and expand their markets. State funding of programs for entrepreneurial development is estimated to have increased by 30% between 2012 and 2013. States vary considerably in the policies, regulations, and taxes that affect small business. Most states have an array of loosely integrated small business programs, although some have a more comprehensive, integrated small business policy and program framework. No state has the “best” tax policy for all entrepreneurs. Instead, different states have tax policies that suit certain types of companies better than others. Consequently, the states that are best for new businesses are not always the most favorable for existing small businesses; the states that are best for one business sector may not be best for another. States and cities should consider small business development not as a separate cause, but as a basic building block for economic growth. Even if state governments can do little to promote enterprise and small business development directly, there are things they can do to increase the chances that entrepreneurs will thrive. Smart, pragmatic economic policymaking at the state level can play an instrumental role in fostering startups and growing companies, particularly when programs are effectively deployed right where the businesses are located. Accelerator initiatives that focus on starting high-growth firms by turning startups into enduring companies. Economic gardening initiatives that focus on expanding existing firms with strong growth potential. Business plan competitions to identify companies with exciting ideas and high potential. Business ecosystem initiatives, often with a regional focus, that take a comprehensive approach to creating an environment that is highly conducive to startups. Workforce development initiatives that help small businesses find and train the talent they need to operate and compete. Seed and venture funds that focus on startups and expanding firms. Networking and collaboration initiatives that bring small businesses and self-employed entrepreneurs together with large companies and universities. International trade programs that help small businesses reach out to new global export markets. Streamlined state administrative processes and regulatory procedures for small business by cleaning up the DURT (delays, uncertainty, regulations, taxes) that impede small business success. Broadband investments that provide small businesses of all types with the online access necessary in the 21st century. Governors of states recognize the importance of small businesses and often take the lead in reforming state policy and service delivery to make growth and commerce easier for small business. Governors can offer fast-track access to financial resources and a full slate of state services that help small businesses connect with technical expertise, customers, suppliers, and state agencies that interact with small business as regulators or partners in development. State and local chambers of commerce are on the front lines of promoting a pro-business free enterprise agenda and thwarting anti-business legislation, regulations, and rules. Across the country, chambers of commerce lead the way in advocating on behalf of their members for lower costs of doing business, fairer taxes, fairer regulations, and less regulatory paperwork. They work with the U.S. Chamber of Commerce, governors, industry, and professional associations to pursue outcomes that are beneficial to all businesses and, thereby, advance America’s free enterprise economy. Visit this site to download the full pdf version of the report, or check the interactive dashboard to see how your state ranks in economic performance and in the five policy areas studied in the report. Submitted by SEO Services on Wed, 05/15/2013 - 19:08. Lets hope the economy picks up soon so we dont loose anymore ground to the chinese. There growth rate is 3 times as fast as US at the moment. Submitted by PhilBest on Wed, 05/01/2013 - 15:51. “We need to explain the astonishing enrichment in bourgeois countries from 1800 to the present, such as Norway’s move from $3 a day in 1800 to $137 in 2006. But the explanation cannot be economic. If it were so — trade, investment, incentives — it would have happened earlier, or in other places. Economics determines how the tide of growth expressed itself down this inlet or beside that quay. Good. But the tide itself had “rhetorical” causes. Prudence is not the only virtue — so are courage and hope, supported by temperance, justice, love, faith, and hope. Through a “Bourgeois Revaluation” redefining such virtues, first in the Netherlands and then in Britain, people started accepting the creative destruction of innovation — and this for the first time. Habits of the heart did not change (contrary to Max Weber, for example). And the means of production itself cannot have produced such a stunning change endogenously (contrary to modern growth theorists). What changed were habits of the lip. It’s not a “rise of the bourgeoisie,” but a rise in other people’s opinion of the bourgeoisie that makes for economic growth — as it is now doing in China and India. When people treat the marketeers and inventors as having some dignity and liberty, innovation takes hold. It was so to speak a shift in “constitutional political economy,” as James Buchanan puts the point. People agreed on the meta-rule of letting the economy go where it will. This contrasted with the earlier mentality, still admired on the left, that treats each act of innovation as an occasion to go looking for its victims. Victims there were, but they were greatly outnumbered by winners. It was ideas, not matter, that made the winners, and brought our ancestors from $3 to over $100 a day. It is a materialist prejudice common in scholarship from 1890 to 1980 that economic results must have economic causes. But ideas caused the modern world. The point can be made by looking through each of the materialist explanations, from the “original accumulation” favored by early Marxist historians to the “new institutionalism” favored by late Samuelsonian economists. They are surprisingly weak. The residual is ideas, in particular the Bourgeois Revaluation of the 17th and 18th centuries in northwest Europe. The argument takes possibly six books, constituting a full-scale defense of capitalism. One is already published (The Bourgeois Virtues: Ethics for an Age of Commerce 2006), and the argument here is of volume 2, forthcoming in late 2010. Volume 3, deo volente, will explore exactly how the Revaluation occurred, first in Holland and then by imitation in England, Scotland, Pennsylvania, and the world. Volume 4 (perhaps included in Volume 3), will explore the balance of interest (Max U) and language in explaining the Industrial Revolution and its longer-term consequences. If my energy holds up, a volume 5 will explains why the clerisy of elite artists and intellectuals turned against innovation after 1848; and a volume 6 will ask which of the present-day complaints about free-market economies has merit. “………..Why did the North-Sea folk suddenly get so rich, then, get so much cargo? The answers seems not to be that supply was brought into equilibrium with demand — on the contrary, the curves were moving out at breakneck pace. Reallocation is not the key. Language is, with its inherent creativity. The Bourgeois Revaluation of the 17th and 18th centuries brought on the modern world. It was the Greatest Externality, and the substance of a real liberalism.